We found a box of this at Aldi last week and yesterday we had some friends over for a True Blood gathering. (True Blood, the HBO series). Anyways, I decided to make these for the snack and it was a great value because we paid $2.89 for the box of banana chocolate chip monkey bread and it produced 24 decent sized ball snacks. I would say no more than 2 would equal a serving. So it could feed up to 12 people if everyone had 2 balls. 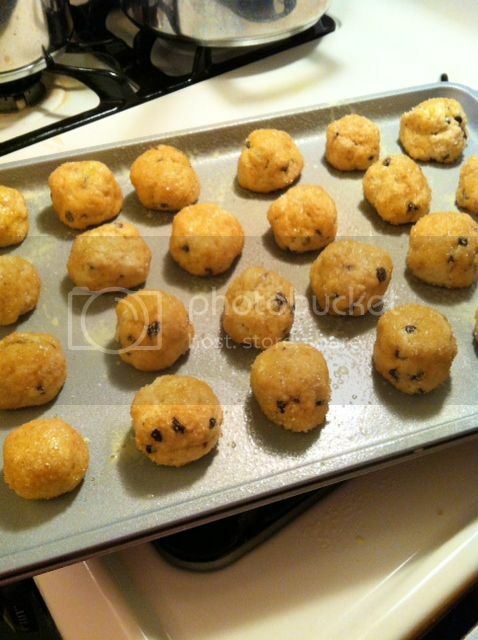 Here is an image of before I put them in the oven. Afterwards, chocolate is drizzled on the top. Anyways, I simply followed the instructions on the back. Part of the instructions says to drizzle melted butter across the top of them, but I simply did 1 spray on each ball of spray butter! Much easier. They turned out really good. I took mine from the oven at 25 minutes and they were slightly over cooked, so I would recommend checking yours at 20 minutes. They taste better the next day, in my opinion, and are softer. Store them in a zip-lock bag at room temperature. Idea: Instead of drizzling chocolate on the top, put a chocolate hershey kiss in the center of the ball and wrap the dough around it for a chocolate, gooey center. oh my! my cat does the exact same thing!! Too Cute! Love your blog! I'm getting back into ALDI shopping myself. I have to hunt for their gluten-free goodies though! But they are getting better and better at stocking them!